If you need an improved garage, you can count on Custom Garage Works! In 2003, we started offering high quality garage floor coating in Grapevine, TX after we needed more out of our own garages. We set out to create the perfect garage for ourselves and our growing families, but when we could not find what we were searching for within the current industry, we decided to jump in ourselves. Presently speaking, we are proud to provide our clients with some of the best garage storage solutions on the market, as well as floor coatings that are stronger and more durable than traditional epoxy. Our contractors are professional trained, and we are passionate about creating custom garages, with impressive garage floor coating results across DFW. 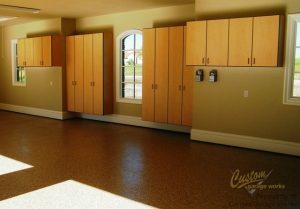 One of our most popular garage options is our garage floor coating in Grapevine, TX. This boom in popularity is probably because our coatings are more durable than epoxy, and cure faster, which means that you can drive in your garage within 24 hours in most scenarios. While with epoxy floor coatings, you need to avoid UV exposure and be on the watch for flaking, our polyurea-based floor coatings are much more durable. In addition to our floor preparation, which includes professional diamond grinding, instead of acid etching, you end up with a showroom quality floor that is easy to clean, and practically indestructible. If you’re interested in hearing more about our garage floor coating service, you can schedule your free estimate when you call 214-494-9068 or 817-308-1305. Epoxy Coatings Epoxy coatings are not the best method for coating your garage floor, but they are generally inexpensive. When you are running out of space in your garage, Custom Garage Works has the right garage storage and organization solution for you! 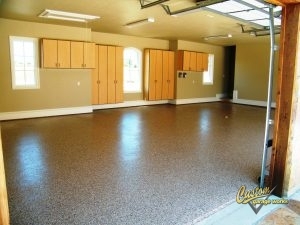 We recognize your new garage floor coating looks better when it is not covered by clutter! With products such as garage cabinets and overhead storage racks, we have a variety of solutions for our clients’ garage organization needs. We provide some of the most resilient overhead storage racks in the industry, and our storage cabinets are specifically designed for garage needs. We are dedicated to helping our clients get the perfect garage floor coating and organization for their needs and budget, and we look forward to assisting you! Overhead Storage Racks Don’t waste your overhead space! Our overhead storage racks help you get more out of your garage. Car Lifts A residential garage auto lift is simpler to use than you might think!